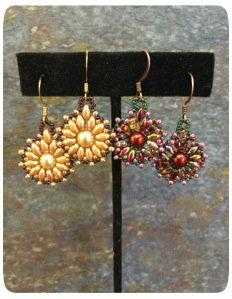 Gail designed these earrings a few years ago while staying at Wildacres Retreat where she teaches a few times a year. These adorable little earrings use a few different kinds of beads, all of them included in the kit you'll get when you sign up! Seed bead stitching doesn't involve much in the way of "instant gratification" but these come close. You'll have a brand new pair of earrings in no time! Instructor is Michelle. Class fee includes kit.